...a post. But instead of telling you about my sunday eats (which were unhealthy, eaten in the car, in ikea or out of a dominoes box) I decided to break up today's food journal posts. Since I missed out on all of my baking plans this weekend (a trip to Ikea and the resulting piles of boxes, plastic wrap, tiny allen wrenches and discarded old furniture will do that to you...) I'm hoping to play a little catch-up tonight and tomorrow night. Which means lots of pictures of baked goods are coming. Yum. 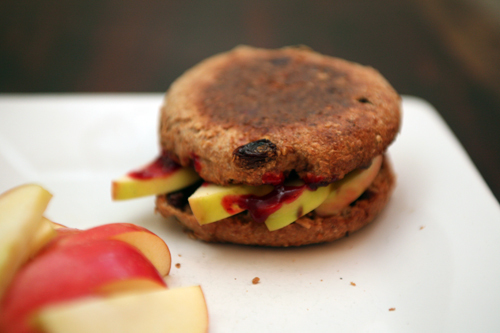 Breakfast: toasted Ezekiel Cinnamon Raisin Muffin with 1 tbsp almond butter, sliced apple and 1 tbsp cranberry ketchup. I'll give you a preview of what I'll be eating for lunch and my snack today. I pack my food in the morning and take all of my photos before work, which is why I always have the same background in my shots. I like the consistency, and it allows me to avoid awkward questions from my boss and co-worker. They just don't need to know about the blog. Not yet anyway. 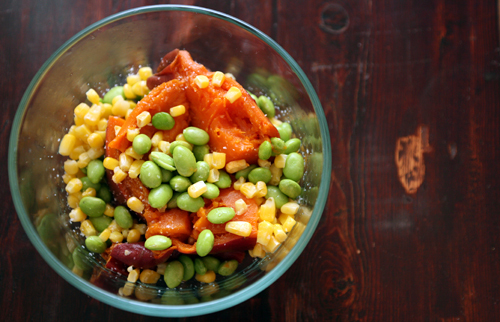 Lunch: baked sweet potato with 1/2 cup of corn and 1/4 cup of edamame...and a good sprinkle of sea salt. 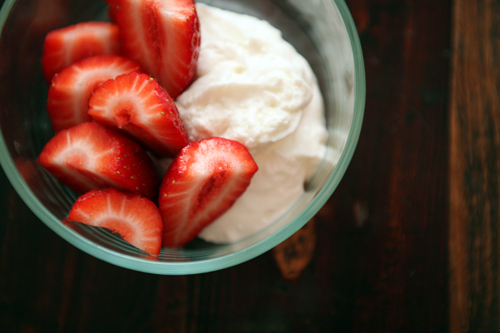 Snack: 1/2 cup of Fage 0% and 4 beautiful strawberries. IN: make your own by chopping up bread and placing in a low-heat oven until brown and crispy. Mark claims they will keep for a long time! IN: fresh spices - if you take a whiff of your spice jar and get dust or a musty smell instead, toss it! IN: dried beans. Cook up a pound over the weekend to use all week long. They taste better, are more economical and take up less space in your pantry. There are so many other great suggestions...check out the article!